There are a lot of factors which contribute to stress in our lives. It could be a job, relationship drama, or even a lack of sleep that can result in the feeling of stress. However, there are a few techniques that can help ease this stress. Meditate: If you want to relax, meditation is a great way to do it. Meditation is the practice where someone trains their mind to block out the incessant activity and rather focus on a thoughtful awareness. It can help reduce stress and even lower blood pressure. Exercise: Exercise is a great way to relieve stress, because not only does it improve your overall health, but also your well-being. It also elevates your mood by releasing endorphins in the brain—the feel-good hormone. Log off: Having a detox from social media is a fantastic way to de-stress. Avoid the images in the media that are making you feel bad about your body and resulting in low self-esteem, avoid the drama that’s happening on Facebook, and focus on the real-world, and your relationships in the real-world, instead of becoming absorbed by what's happening online. Focus on your breathing: It may seem like an extremely simple thing to do, but breathing deeply can relax you. 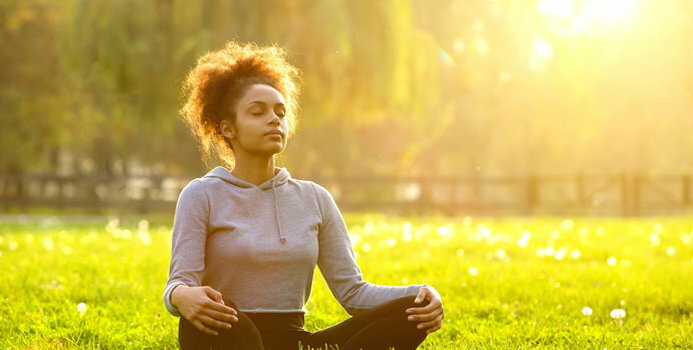 Try out breathing exercises, like belly breathing or roll breathing, which can help clear your mind and reduce your stress levels. Learn what triggers you and step away: Spend time figuring out what your triggers are, and learn how to deal with them in a healthy way. Eat well: If you’re not eating well, you can become depressed and stressed. Avoid foods that are high in trans-fats, oil, and sugar, and instead, eat a balanced diet. Also, foods like dark chocolate, which contains antioxidants, salmon and fish that contain omega 3s, and citrus fruits which contain high quantities of vitamin C, can actually help reduce stress. Sleep well: Sleep is important, and if you are not getting enough sleep or a low quality of sleep, then this could lead to increased depression or stress levels. Try to turn off your technology before bedtime, avoid coffee after the afternoon, avoid big meals before going to bed, and don’t nap during the day.